Deer hunting is one of the most ancient practices of human being. But the terms are now changed a bit. Deer hunting is now become a popular hobby across all over the world. The basics of deer hunting are not very easy. There a lot of tricks you have to follow. Otherwise you will just keep searching for it but won’t found any. To find a game like deer you should learn the basics of hunting at first. All of the parameters are important in hunting. From a water bottle to a spotting scope everything is important while you are hunting something. The safest game hunting will be deer hunting in my opinion because they won’t counter attack you. That’s the main reason why people love to hunt games like deer. But you must take some advanced preparations as well to prevent unexpected situations. In this article I’m going to talk about some tips and tricks which you will need in deer hunting. Get the best spotting scope for identifying games: Spotting scope is the most useful equipment for hunting deer. Most of us get confused between spotting scopes and binoculars. We can’t choose one between a spotting scope and a binocular. As the binocular is one of the most common equipment, we choose binoculars for spotting a game. But without knowing the merits and demerits of a binocular we shouldn’t buy one. Spotting scopes are specially designed for spotting big games like deer. So from my experience I will suggest everyone for choosing a spotting scope instead of a binocular while hunting deer. While gaming, a spotting scope may create some troubles. First of all, the zooming fact. If you crank your spotting scope more than 40x then you will face some troubles. They are the exit pupil shrinking and heat wave. I have faced these problems personally that’s why I’m talking about this. As the sun goes higher the temperature rises. The light also goes brighter but at a 60x position you won’t see many things in detail about the game. This happens because the heat wave. That’s why you must know how to use the spotting scope. Another fact is clear looking. A spotting scope lets you to get a clear view of the animal or we can say deer. Now there are some deer which is illegal to hunt. If you are not aware of them unfortunately you may kill one of them. So before hunting you must get a clear view of the game to identify if the game is legal to hunt or not. A spotting scope will help you out to get the clear view of the deer. Get yourself to the track: Now when you are ready for hunting let’s follow some rules of hunting big games. First thing you have to set the spot for hunting. I would suggest a flat hard spot for hunting. This is because it is the good place for identifying a deer. You may take cover beside a rock or something that covers you. After that, set the spotting scope on a tripod. I think a tripod is the best option for you to scan for games. By using your hand you will not concentrate at one place smoothly. Also the spotting scope is not a light instrument. After setting the scope scan as fast as you can. This is the most important part of hunting. You have to be super fast while scanning and also you should be attentive to the place and everything. Take all necessary instruments and use them properly: For hunting you can use rifle, shotgun or a bow. But remember the equipments must be licensed. Then I think you need to wear hunting clothes. Some other necessary equipments are decoys, calls, water bottle, knife etc. All of them are necessary while hunting. Also you can use a spray to hide the scent. There are some specific sprays in the market which hides the scent of human body. Deer can smell human scent from a mile away. If it smells human body then it will run away from that place. If this happens then all of your hard works will go in vain. That’s why you need to be fully prepared before going to hunting. If you intend to stay for a quite long time or someday then you can also take a tent, sleeping bag and enough foods with you. The first thing a beginner should learn is how to use a shotgun, bow or rifle and also how to use a spotting scope. For me the most useful deer hunting secrets are morning deer hunting tips and deer hunting alone. Also how to see more deer while hunting is a fact for learning for every beginner. I will suggest beginners to see deer hunting tips youtube. From there you will get to learn about the best way ton hunt deer. For the beginners all of the tips and tricks mentioned in the article are strongly recommended. But it will be hard to understand things at first. So in my opinion you should get advice and guidance from an experienced hunter. If possible, take an experienced deer hunter with you while hunting. 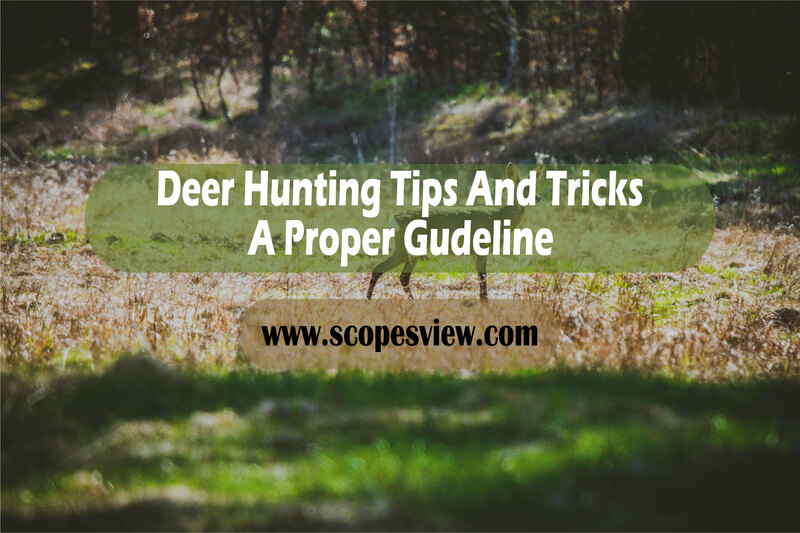 It will be more reliable to understand deer hunting process practically. Hunting is not an ordinary hobby. It needs courage, physical ability, mentality and other stuffs. To hunt big games like deer you must know the vital tricks of hunting. Without this knowledge you are going to run and wait for the whole day for a prey. But this waiting will not get you a deer. It is you who will make things easier and smooth. So learn the tricks as soon as possible and go to the track with full preparation. Best of luck hunters. Thanks selfpatron team for contribution this helpful content.